Can you advise on the availability of the cartridges compatible with the HP LaserJet 5SI printer and their prices? Unfortunately, these compatible HP 98A and 98X toner cartridges only work in the LaserJet 5 or LaserJet 5n printers and aren't the correct cartridges for use in the LaserJet 5SI printer model. The Laserjet 5SI printer uses the HP 09A or 09X toner cartridges but, unfortunately, both of these cartridges have now been discontinued so we don't currently have any cartridges available for the LaserJet 5SI printer which is why this model is no longer listed on the website. We'll only ever provide cartridges that are compatible with your printer, and that's why you won't have to be scared of the cartridges causing some issues. Not only do you get the rock solid promise for top quality toners, we'll make sure to get your purchase to you fast for free! For a store promising great customer support coupled with the most affordable pricing available for HP toners, then obviously Cartridge Save is going to be the best store for you. Now in Cartridge Save you will enjoy totally free delivery with every single order, irrespective of what you have ordered. We pride ourselves on that 98% of all orders placed arrive the next day. You'll get satisfaction if you place an order from us courtesy of the rock-solid thirty day refund promise. If you experience any problems using your HP 5 laser toner cartridge within thirty days after purchase you simply have to post it back for your total money back. The HP LaserJet 5 is a excellent workgroup printer that will keep up with any personal or small office use. It is a laser monochrome printer that can print up to 12 pages per minute with ease and in a resolution of up to 600 x 600 dpi. Furthermore, this printer is energy-efficient. During operation, it uses just 290 watts and then reduces consumption down to only 24 watts during sleep. The HP LaserJet 5 has a simple box design that accompanies a white enclosure. It is very space-efficient at dimensions of 44.19 cm in width, 40.89 cm in depth, and 40.89 cm in height. This printer is also moderately heavy at a weight of 17.01 kg. In addition, the LaserJet 5 is designed to handle printing on envelopes, transparencies, labels, and plain paper. The input tray is also able to hold a capacity of up to 350 pages, while the output tray holds 250 sheets. HP 5 toner is created to print on up to 6,800 pages before needing a refill. A high capacity HP 5 toner cartridge is available with a higher yield of 8,800 pages, which will further reduce your running costs. Optional duplex printing is also included, which would allow users to print on both sides of a page and reduce paper consumption. The HP LaserJet 5 also has a memory expansion slot to allow for additional memory. This particular printer can upgrade from 4 MB up to 68 MB to improve performance and storage capacity. At a monthly duty cycle of up to 35,000 pages, the LaserJet 5 can will easily meet the demand of an individual user. HP LaserJet 5 toner is also very inexpensive at a cost, so the printer's upkeep is inexpensive and very cost-efficient for the amount of documents that can be printed. 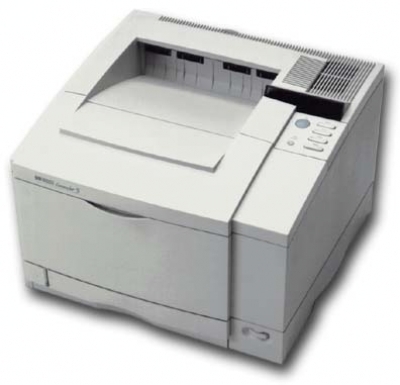 The HP LaserJet 5 has no copier, scanner, or fax machine. In addition, a major downside to this printer is the lack of networking capabilities. Ultimately, this printer would best serve its purpose in a low-volume application and not in a busy office. For many users, this printer operates loudly at a sound level of 55 decibels and may not be suitable for a quiet atmosphere.